Despite a great start to the season, many still may not know what to make of the Pitt volleyball team because of some weak non-conference competition. After Sunday, people may have a better idea. The Panthers will play Boston College at home on Sunday in their first ACC matchup of the season. The team says the heightened level of competition will help them round into form. While recent history favors the Panthers (12-1, 0-0 ACC), head coach Dan Fisher knows any ACC team is still dangerous. Last season, Pitt swept Boston College (5-4, 0-0 ACC) in the two encounters between the teams. Pitt won 3-0 against the Eagles at home in October, and held them off 3-2 in a close battle in November. Pitt currently rides a six-game winning streak against BC. “We certainly don’t want to get caught up in what last year looked like or anything like that,” Fisher said. The Panthers exceeded ACC expectations in their conference debut last year and may improve upon that this year. In the final 2013 conference rankings, the team found itself in a four-way tie for fifth with an 11-9 conference record. Once again, Fisher and his squad were predicted to finish in the bottom half in the preseason poll, but the ninth-place ranking out of 15 teams has been a fire for the players. With their experience, the Panthers have their sights set on proving everyone wrong once again. Fisher agreed with his senior setter. Boston College may be better than what their record shows, however. The Eagles, who finished last in 2013 and were predicted to finish last once again this season, have faced tough non-conference opponents like Minnesota, which was ranked 18th at the time. Boston College fell to the Gophers 3-2, and lost the decisive fifth set 15-13. One of the Eagles’ best players is senior libero Courtney Castle. Prior to this year, Castle spent the last three seasons as an outside hitter, but she has adjusted well so far. Castle, who missed the first weekend of play, averages 4.05 digs per set. Another star player for Boston College is outside hitter Katty Workman. The junior has had single-match career highs against Pitt, all coming in the 3-2 loss to Pitt last season. Workman tallied five assists, four block assists and four total blocks in that match. This season, Workman has 173 kills and averages almost four kills per match. 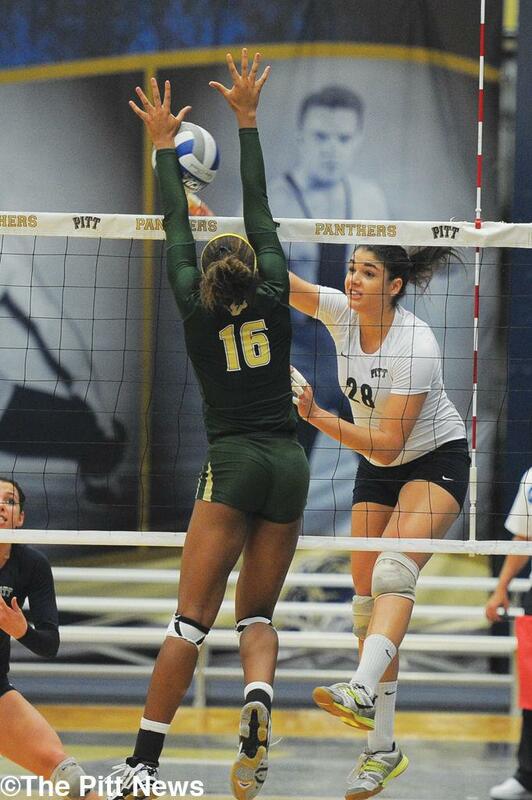 The 173 kills place her fifth in the ACC, just above Pitt’s own middle hitter Amanda Orchard. Despite the Eagles’ improvement, Jacobson said she believes that playing against BC will be OK.
“We have our scouting report against them and we studied that and kind of know what their tendencies are. I think that we’ll have a fair shot,” she said. A success for Pitt will require a team effort. Orchard is hitting an impressive .459 per match and has totaled 76 kills and 34 blocks so far. Middle blocker Jenna Potts leads the ACC in blocks per set with an average of 0.93. Libero Delaney Clesen also finds herself in top five of ACC leaderboards in two categories. Clesen leads the conference with an average of 0.50 aces per set and has recorded 19 total so far. Clesen also ranks second in digs per set with a 4.45. Senior outside hitter Jessica Wynn, who was the team’s only preseason selection to make the All-Conference team, is also playing at a high level for the Panthers. The match is scheduled for 1 p.m., and the match will be aired on ESPN3. The game plan for the Panthers is simple, according to Zitzke. “We just have to not worry about the other team and really just bring our own game and know what we need to do,” she said.